For my last analog review, I reported on the all-out effort from Audio Research in the phono-preamp arena -- the Reference Phono. 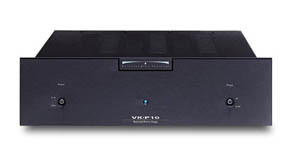 This time, I was handed the all-out effort from Balanced Audio Technology, the VK-P10 phono stage. Although BAT has been on the scene for a considerably shorter time period than Audio Research, it needs no introduction as a company. BAT products have garnered considerable praise and respect in the audio marketplace due to their excellent performance, sound engineering, and high level of quality -- by whatever measure you choose to judge them. The VK-P10 carries on in standard BAT tradition -- and I promise no BAT jokes. Sound "Lively, energetic sound"; "while not displaying the traditional characteristics of a solid-state piece, it is the antithesis of lush or syrupy"; "the all-important midrange is a delight through the VK-P10." Features All-tube circuitry; adjustable gain, capacitance, and loading, including a neat method for applying user-supplied values; balanced and single-ended inputs, but only balanced outputs (although BAT makes a converter for using the VK-P10 with a single-ended preamp). Use "The VK-P10 is a performer of considerable merit in a single-ended configuration, and scales even loftier heights when set up to run balanced." 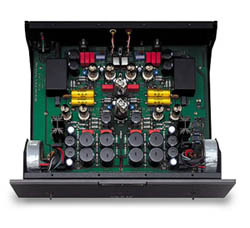 Value Top-flight phono stage that justifies its high cost with sound that's competitive with the best available. The VK-P10 is housed in the traditional BAT-style chassis, with a black, painted exterior and the visually stunning dark-gray faceplate. As is the norm for all BAT products, fit and finish are impeccable. The faceplate is adorned with an on/off toggle switch on the left, a blue LED in the center, and a phase-inversion toggle switch on the right. On the back panel reside pairs of single-ended and balanced inputs, and a pair of balanced outputs. No single-ended outputs are provided -- a converter (available from BAT) must be used to make the conversion if your preamp is not equipped accordingly. A standard 15-amp IEC receptacle is sited next to a line fuse holder, and a heavy-duty grounding post completes the back panel provisions. Ample space is provided for all connections, making it easy to connect even thick-jacketed interconnects and power cords. My only complaint with the general aesthetic is the power LED up front -- its just way too bright and distracting in a dark or dimly lit room. Removing the top cover reveals a masterpiece of thoughtful design and build quality. One circuit board carries all the components with the exception of the twin torroidal power transformers gracing the front corners. A pair of 6SN7s are located centrally, and eight 6922s make up the rest of the tube complement. All tubes are Sovtek branded -- very reliable, easy to obtain, and inexpensive. As this was a review piece, I did not play any tube-rolling games. But oh, the possibilities! Inside and near the back of the chassis are several switches for setting gain and cartridge loading. The flexibility provided here really sets the VK-P10 apart from most other phono stages. There are switches for selecting between direct and hi-gain settings, the latter running the signal through high-quality step-up transformers for very low-output cartridges. While the direct setting provides the purest route for the signal, going through the transformers did not present audible problems. In addition to the gain switches, there is a pair of potentiometers for even finer tuning of this parameter. A pair of DIP switches (one for each channel) provide easy adjustment for cartridge loading and capacitance. The VK-P10 sports a 47k-ohm load to the cartridge as a default, and provides additional load settings for 100, 1k, and 10k ohms, and capacitance for 100, 470, and 1k picofarads. A real neat trick is an additional switch position for user-supplied values, accomplished by inserting gold-plated pins into sockets in the DIP switch itself. The desired value of capacitor or resistor is soldered to these pins (which can be done outside the chassis), and then inserted into the sockets. A number of pins are supplied, and more can be obtained from BAT if needed. Ill say again -- this is a really cool method for providing user-desired loading values, darn near ingenious. In the setup and operation manual, BAT is careful to point out the importance of proper gain-setting selection. With the combination of switches and potentiometers, the overall gain can be adjusted from 50dB to 73dB, with a total of six discrete settings. Thats a whole heap of gain, in case you were wondering. Pay close attention to their advice, however. I found that selecting too high a gain setting offered a presentation that could be a bit fatiguing and overly forced-sounding in nature. Selecting the next-lowest gain position ameliorated this problem, with the lesson being that the best gain setting is the one that is just enough, and no more. Dont get all paranoid thinking this requires months of fiddling with to optimize -- I settled on the best value in less than an hour. During the review period, the VK-P10 spent time processing signal from both Benz-Micro MC-SCHEU and Dynavector Te Kaitora cartridges. The Benz outputs .33 millivolts, the Dynavector an even lower .25mV. The VK-P10 had no problems providing sufficient, noise-free gain for either of these fine vinyl plows. Although the Dynavector is one of those truly special audio gems, the Benz mated up with the VK-P10 with a very special synergy. Perhaps the slightly higher output was responsible, but it was more likely due to the somewhat warmer and more lush presentation of the Benz offering a nice marriage to the VK-P10. Overall, the VK-P10 comes across with a lively, energetic sound. One might think that with all those tubes glowing inside the case that the VK-P10 would have a tubey sound to it. It does not. While not displaying the traditional characteristics of a solid-state piece, it is the antithesis of lush or syrupy. Tossing Stevie Ray Vaughans reissued "Tin Pan Alley" on the platter (from Couldnt Stand The Weather [Sony/Epic 25940]), I was immediately impressed with the low background noise, the excellent and effortless dynamic swings, and a nice sense of the ambience and depth of stage. While the latter properties are typically portrayed in fine fashion by most tubed components, the noise and dynamic abilities are often the calling card of solid state. Not so here. Loudspeakers  Coincident Speaker Technology Super Eclipse. Amplifiers  Cary Audio Design 805C, monoblocks, Audio Electronic Supply AE-25 Super Amp monoblocks. Preamplifiers  Audio Research Reference Phono, Cary Audio Design PH-301 Mk 2 MC/MM phono stage, Audio Electronic Supply PH-1 MM phono stage. Digital  Audio Electronic Supply CD-1 (modified). Interconnects and speaker cables  Coincident Speaker Technology interconnects and speaker cables, Coincident and Cardas Golden Cross (phono). Power conditioners and power cords  PS Audio P300 Power Plant, Shunyata Research PowerSnakes King Cobra. Accessories  Black Diamond Racing cones and Round Things, SolidSteel rack, home-brew sandboxes, Silent Running Audio amp stands (custom for the 805Cs), ASC Half Rounds and Tower Traps, Marigo Audio Labs VTS tuning dots, Michael Green Design Pressure Zone Controllers. Having this recording on both LP and CD made some sonic comparisons quite easy. Through the VK-P10, the vinyl was a bit noisier (duh), but offered so much more harmonic information, natural decay, air, and space that any extra noise fell on deaf ears. Bass lines were actually stronger, coming through with a punch and natural unfolding that made the CD sound like a closenplay in comparison. .Yet [Ichiban ICH-1141], Carters voice is prominent in the mix, overshadowed only by a throbbing bass guitar. With the VK-P10, his voice takes on a slight hint of stridency, as if he were holding the microphone closer or standing closer to it. This was not really distracting, nor was it fatiguing or irritating. It was noticeable, however. Perhaps it was more faithful to the actual recorded performance -- I didnt have the pleasure of attending that session. It was a bit more forced than Im used to hearing though. Talking Heads' "Papa Legba," from True Stories [Sire 25512-1] is always instructive in the space and soundstaging departments. Theres a lot going on at the beginning of the song, starting with a synthesized cymbal whipping between and around the speakers. The VK-P10 was marvelous in this regard, offering a real, 3-D perspective on this admittedly artificial sound. The bass lines came through distinctly, nicely defined and with a huge slam factor. In fact, I was getting into the performance so much that I didnt pay attention to the volume setting, that is until the amps started huffing and puffing. This recording gave some nice insight into the VK-P10s transient abilities as well, being quick and decisive on the initial attack. I find that music loses excitement with any front-end piece that meanders into a transient instead of giving it a sucker-punch and moving onto the next just as quickly. No warm fuzzies or beating around the bush here. Finally, the all-important midrange is a delight through the VK-P10. Spinning up Tina Turners "Typical Male" (Break Every Rule, [Capitol PJ-12530]) was an absolute delight. Turners husky voice was portrayed in a most believable fashion. There is no apparent editorializing, as this particular recording is borderline in sonic quality. The VK-P10 did nothing to pretty it up, nor did it do anything to mask the recording for what it was. If you want a preamp that makes all your recordings sound good, youll need to look elsewhere. But if all your recordings sound good through any component, you should probably begin to wonder how badly its masking resolution and hiding the information that truly exists. As my system is all single-ended, there was no opportunity to listen to the VK-P10 in a balanced configuration. Failing to allow it the opportunity to strut its stuff the way it was intended would be unfair, so with permission from BAT, the VK-P10 went to spend some time at audio pal Vics house. Vics system consists of the BAT VK-50SE preamp driving a pair of VK-60 monoblocks in balanced mode, Dunlavy SC-IV/A speakers, and analog signal fed by a Merrill Heirloom turntable fitted with an Eminent Technology 2 air-bearing tonearm and a Benz-Micro Glider cartridge. Although I travel to Vics house for regular listening sessions, Im not intimately familiar enough with his system to make absolute sonic assessments. His system did, however, provide a meaningful basis for comparing the sonic performance of the VK-P10 in balanced vs. converted single-ended operation. When run through the balanced outputs, the sonic changes were not insubstantial. There was a much greater dynamic capability, with soft-to-loud passages gaining an increased spread of volume shift. Bass was more powerful, with a heightened perception of slam and drive. There was also an increased sense of space and airiness, with more hall effect and stage depth, and this was likely due to the biggest difference noted -- a reduction in the overall noise floor. Groove noise was reduced, and with volume settings that produced the same perceived overall loudness, there was a marked reduction in the audibility of surface defects (pops, snaps, etc.). I did not, however, hear any significant changes in the tonal character when run in balanced configuration -- the VK-P10s hierarchy on the warm-to-bright scale remained the same. Some may question the validity of doing the majority of the listening evaluations in a single-ended mode with a component that is set up for balanced operation. A reasonable question, to be sure, but the impressions gained while run fully balanced would indicate that the basic character remained the same. More dynamics, better signal-to-noise ratio, but the VK-P10 still sounded like the VK-P10, regardless of how it was run. The important point is that this phono stage is a performer of considerable merit in a single-ended configuration, and scales even loftier heights when set up to run balanced. If you have balanced inputs, rejoice. If not, you can still enjoy the majority of what the VK-P10 has to offer. During my time with the VK-P10, I was also fortunate enough to have on hand the Audio Research Reference Phono (reviewed previously), and the new Cary PH-301 Mk 2 phono preamp. The ARC unit is the most expensive of the group at $6500, and the Cary the least, at $3500. All are the top offerings from their respective companies, and all are serious money. What I found was that while each presented the music with a different sonic flavor, all three were quite excellent at performing their appointed task. Each was beyond reproach at the basics, being devoid of gross colorations, able to provide sufficient gain for low-output cartridges, and capable of the resolution that justified their price tags. The ARC was the quietest of the three from an overall extraneous-noise standpoint, and it did a wonderful job reducing the distraction of pops and snaps caused by blemishes or dirt in the groove. All-too-familiar noise artifacts on prized-but-used LPs were simply not as intrusive. The ARC also had the edge in macrodynamics, with soft-to-loud passages coming across in a sometimes-startling manner. While its tube-powered roots were evident in its ability to reproduce body and dimension, it was probably the least tubey sounding of the three. The BAT fell squarely in the middle of the ARC and Cary units as far as tonal balance. While not as warm-sounding as the Cary, it fleshed out the midrange with more fullness and bloom than the ARC. And while not as dead-silent at the groove-noise thing as the ARC, it was still very quiet and shoved non-musical artifacts well into the background. The VK-P10 portrayed a slightly livelier perspective through the midrange than either the ARC or Cary, which on one hand could lend some additional excitement, but could also be a liability on less-than-stellar recordings. The VK-P10 was the best of the three at transient behavior -- it was superb at the instantaneous attack of notes, and could get off a note as quickly as it got on. The Cary was the most tubelike, with an abundance of warmth and body in the midrange. While noisier on an overall basis than either the ARC or BAT units, remember were talking about some very serious phono preamps here as a group, and the noise level was still substantially lower than any other phono stage Ive heard. The Cary was unique, however, in its ability to delve deep into the notes structure and unravel the harmonic micro-detail. With the Cary, it was more as if you were listening into the note, rather than just listening to it. Perhaps sounding tubelike is not such a bad thing. All three phono stages offer a superb level of performance. As with anything audio, they each have a distinct sonic character and different sets of strengths. What floats your boat will depend on your choice of cartridge and your priorities in a final sonic picture. As always, auditioning the preamp in your own system cannot be substituted by a few hundred words in a review. The VK-P10 is a supremely well-built, flawlessly performing piece of audio gear. It gets high marks for its incredible flexibility and ease of configuration. With its gain capability, any possible consternation about the use of very low-output cartridges is put to rest. Neither warm-sounding nor bright and etched, it carries forth the strength of tube-based designs with minimal tube-typical colorations. If partnered with the right cartridge, it offers a significant slice of musical bliss. Bright and/or treble-tilted cartridges would not be my personal choice as a suitable mate -- better perhaps would be a warmer-balanced cartridge to offer a more synergistic match. The VK-P10 sings its best when run via the balanced outputs, but it is certainly no slouch when converted to single-ended operation. If youre in the market for a high-caliber, high-performance phono stage, be sure to put the VK-P10 on your auditioning list. Warranty: Five years parts and labor, one year on tubes.